MARY NELL HARPER ’48, a nurse midwife and missionary to Ethiopia, Kenya, and Malawi for four decades, was featured in a July news article in The Herald newspaper. She is the longest-attending member of Westminster Presbyterian Church in her hometown of Everett, Washington. She turned 89 this summer and has attended Westminster since she was a month old. “It’s so exciting to deliver a baby and hear it cry,” she said of her Africa years. Mary Nell rarely misses a Sunday at Westminster and still sings in the choir. DARRELL REECK ’60, former United Methodist pastor and retired member of the University of Puget Sound faculty, is the author of Growing Green Two Ways! (CreateSpace, 2013). The book is a memoir of Darrell’s childhood in Western Washington, his outdoor adventures that include bear hunting and fighting forest fires, and his years at SPU. His faith development, from birth to graduation from SPU, is a theme throughout the book. He holds a doctoral degree in religious studies from Boston University and has provided interim ministry for four churches in the Seattle area. Darrell and his wife, LUCILLE WONDERLY REECK ’62, live in Portland, Oregon. DEON PETERSON MATZEN ’66, an oil painter, watercolorist, painting instructor, and kite flyer, created the official poster of the 2014 Washington State International Kite Festival. The limited edition poster grew from an imagination that has captured vanishing rural America on canvas, including old, unrestored trucks; garage sale detritus; and dilapidated barns. Deon lives on Whidbey Island in Clinton, Washington. MIMI HURD CARLSON ’68 is the author of Beyond Never — The Making of an Adventurer (CreateSpace 2014). She calls it a true-life global adventure book for children. “My hope is to inspire children to dream big and triumph over fears,” says Mimi. “Smiling or squirming, they’ll make startling discoveries about our strange and wonderful world.” Mimi lives in Sedona, Arizona. BERYL BRYDGES CARPENTER ’68, ’97, MA ’99 and her husband, ROBERT CARPENTER ’68, manage a guest house in Eurasia. Beryl recently published her first novel, Far From a Pleasant Land (Author House, 2014), set in Spain in 1492. She has also written ESL to Go, a book of 10 adaptable lessons for non-professionals who teach English overseas. The Carpenters’ home base is Poulsbo, Washington. DOUGLAS “DOUG” BICKERSTAFF CC ’69 and ALICIA WINFREY BICKERSTAFF CC ’64 have moved to Trilogy, a 55-plus community in Redmond, Washington. JOHN NELSON ’79 is president of Audubon of Martin County, Florida. The wildlife photographer was a contributor for the National Geographic Channel’s “World’s Deadliest” series in 2013 and is currently the voice of “The Audubon Moment” on Florida Public Radio. A certified Florida Master Naturalist, John holds a degree in sociology with a cultural anthropology emphasis from SPU and lives in Palm City, Florida. SHAWN MCCONNELL ’84 runs a whale-watching tour company with his wife, TERESA SCRIBNER MCCONNELL ’84, after enjoying a 20-year teaching career in Fairbanks, Alaska. A commercial fisherman in his teen years, he now lives and writes in his hometown of Hoonah, Alaska. His first two books, Icy Passage and Night Vision (Chichagof Press, 2014), can be found on Amazon.com. GLENN LURIE ’87 is the new president and CEO of AT&T Mobility where he is responsible for the company’s growth as a leading wireless and mobile broadband provider in the U.S., and expanding globally into new growth areas such as home security, connected car, and mobile payments. Previously, Glenn was the lead negotiator between AT&T and Apple leading up to the launch of the original iPhone. A marketing major at SPU, Glenn was a four-year varsity soccer player and helped win three NCAA National Championships at SPU. Glenn and his wife, SUZANNE SCHWARTZ LURIE ’86, reside in Atlanta, Georgia. BRENT RUBY ’89 is director of the Montana Center for Work Physiology and Exercise Metabolism, and co-developer of Omnibar, a savory natural energy bar that includes grass-fed beef in the ingredients. Omnibars may be found at Pacific Northwest Fred Meyer stores. Brent lives in Missoula, Montana. DANIEL “DAN” TONNES ’95 is a biologist with NOAA, the National Oceanic and Atmospheric Administration. His emphases have included long-term watershed habitat conservation, fisheries management, and research of near shore and estuary environments. As part of the 2014 Summer Lecture Series at The Whale Museum on Washington’s San Juan Island, he spoke on “The Long-Term Investment in Rockfish Recovery.” Dan holds a U.S. Coast Guard Inland Master 100 Gross Tons Merchant Marine License and previously worked as a boat captain on sport fishing boats in Puget Sound and Alaska. An environmental studies major while at SPU, he also holds a master’s degree in marine affairs and is a Kinship Conservation Fellow. Dan lives in Everett, Washington. 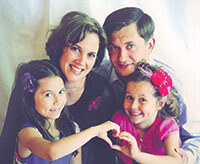 On the eve of Russian invasion of Crimea in February, Sharyn Magers Borodina ’00, and young daughters Gloria and Emily, evacuated Crimea and settled into the 24-hour train ride that would take them to their new home — Ternopil in Western Ukraine. Husband and father Ruslan followed 10 days later with 10 stuffed suitcases and the family dog, Mimi. In the months since, the Borodins, Christian workers with Youth With a Mission, watched the cost of living in Ukraine soar and the price of rent and groceries more than double. Life, says Sharyn, became much more difficult. Despite the adversity, Ruslan helped complete the construction of a YWAM base for ministry in Ternopil, Sharyn has spoken to a women’s group and a youth group about living as Christians, and the girls have completed first and third grades. In September, Ruslan headed up a YWAM project to send outreach teams and humanitarian aid to the Ukrainian side of the conflict zone. Ruslan and Sharyn continue to learn the ropes at the Ternopil base, preparing for the day when they will run their own YWAM base in Sevastopol, Crimea. BRANDON LEWIS ’00 is pastor of the century-old United Presbyterian Church in Albany, Oregon. He, his wife, Hillary, and their three sons moved to Albany from Denton, Texas, where he had served as associate pastor for seven years. Brandon graduated with a master of divinity degree from Princeton Theological Seminary and is currently working on a doctor of ministry degree in proclamation and worship at Austin Presbyterian Theological Seminary. He is glad to be back in cooler climes and hopes to help UPC become a stronger presence in the community. The Lewis family lives in Albany. ALEX THOMASON ’00 hosts a podcast on KOZI community radio inviting listeners to call the attorney and ask legal questions. Alex recently appeared on KING 5, NBC Montana, and NBC Idaho discussing his role as the lead attorney for damages from Washington’s massive state wildfires in 2014. He also recently emceed Miss World Canada and Miss Idaho USA and judged Miss Montana USA. Alex starred on season three of TV’s The Apprentice, where he finished in the final four. He has also discussed business and the law on FOX, CNN, and Good Morning America. A nationally ranked skier, Alex earned his law degree from Seattle University School of Law. He lives in Brewster, Washington. HEATHER EGGEN BOWMAN ’01, an attorney with the firm Bodyfelt Mount in Portland, Oregon, was recognized in the 2014 issue of Oregon Super Lawyers magazine. Named among the top 5 percent of attorneys in the state as chosen by her peers, Heather concentrates on employment litigation, professional malpractice defense, and insurance coverage. She and her husband, JIM BOWMAN ’99, live in Portland. ALLISON GRIFFITH ROTH ’03 is the founder of With Love, a nonprofit agency that serves foster families in greater Portland, Oregon. Quality clothing, stuffed animals, books, and other supplies for children up to five years of age are free of charge to foster families during “Foster Parent Night Out” events at local churches. With Love is staffed by volunteers, including SPU freshman and Allison’s summer intern, BRITTANY RAGSDALE. Allison lives in Lake Oswego, Oregon. RUBY REDD HANSEN ’03 is a program manager for Microsoft and lives with her husband, Jeffery Hansen, and their family in Kent, Washington. JEREMY TREAT ’03 is pastor for equipping and theology at Reality LA in Hollywood and an adjunct professor at Biola University. He is the author of The Crucified King: Atonement and Kingdom in Biblical and Systematic Theology (Zondervan, 2014). The book is an updated version of Jeremy’s doctoral dissertation at Wheaton College. Jeremy lives with his wife and four daughters in Burbank, California. LINDSAY WHELEDON LEE ’06 has graduated with honors and a master’s degree in counseling from Northwest Nazarene University. She is a middle school counselor in Nampa, Idaho. Her husband, KEVAN LEE ’05, is a lead writer with a tech start-up and has enjoyed syndication with online publications. The Lees live in Nampa. JULIANNE GIBSON WILLIAMS ’06 has been awarded a three-year, full-ride doctoral scholarship at Oxford University with the Nuffield Department of Population Health. Her doctoral thesis will focus on rural schools as sites of health promotion. She will continue collaborating with the World Health Organization and the World Bank to investigate prevention of noncommunicable diseases within Sri Lanka. Julianne holds a master’s degree in public health and lives in Oxford. LINDSEY WILLIS HAYS ’07 is a registered dietitian who works for the Indian Health Service on the Rosebud Indian Reservation in Rosebud, South Dakota. Her husband, ANDREW HAYS ’07, MA ’12, is manager of teacher leadership development with Teach for America, based in Mission, South Dakota. The couple lives in White River. LAURA ZOELLER PRAT ’08 moved to France for graduate school and to teach English, fell in love with a Frenchman, married him, and moved him to Seattle this year. Laura is a French language specialist and teaches French at Epiphany School in Seattle, where she and husband, Maxime, reside. MARCUS EBY ’09 graduated in May from New York Medical College and works for the University of Miami as a resident surgeon. Kevin Lakey ’05 of Kennewick, Washington, may know more about set-backs and achievement than most people. On May 20, 1999, he was wrestling with friends when he landed headfirst on the living room floor and broke his neck. He was paralyzed from the chest down. A year ago, he was diagnosed with Chronic Myelogenous Leukemia, or CML. But that’s only half the story. Six years after the wrestling accident, he graduated from Seattle Pacific University with a bachelor’s degree in computer science and now works in the IT department at Pacific Northwest National Laboratory, a large research and development government contractor. This year, he earned an MBA from the University of Washington. Last January, he completed a six-year term on the Washington State Governor’s Committee on Disability Issues and Employment. And his form of leukemia, it turns out, is treated with daily pills rather than toxic radiation or chemotherapies. Leaning on the promise of Isaiah 40:31 that he will soar on the wings of eagles, his strength renewed, Kevin is unafraid of what’s next. One of his priorities is to connect with and visit those who have sustained spinal cord injuries resulting in some level of paralysis. Through his own journey of pain and faith, he wants to give them hope that a full life is not wishful thinking. AILEEN AUSTIN MA ’10 is events program manager and technical recruiter at Amazon.com. She plans and oversees domestic and international staff hiring events for software developers and other technical talent. Aileen lives in Seattle. ALEX KATO ’11 won the Massachusetts Bible Society’s 2014 Donald A. Wells Preaching Prize for his sermon titled “Jesus’ Strange Economy.” The judges were impressed not only by the quality of his writing on food security and wealth vs. poverty, but in his confident yet compassionate manner of delivery. Alex, the son of Professor SHARLEEN KATO, co-director of the Department of Family and Consumer Sciences, received a certificate and a small scholarship. He is a student at Gordon-Conwell Theological Seminary and lives in South Hamilton, Massachusetts. JOE MILLER ’13 and AVERY MILO ’12 are co-founders of Helm and Harbor, a “visual storytelling agency” that employs film, photography, and writing in support of nonprofit organizations and socially minded businesses. “This is everything we are passionate about and we are very excited about the future,” says Joe. In 2013, they completed their first feature film on the tensions in Israel and Palestine. “Once these stories are told, we can begin to understand the conflict and take part in the reconciliation process one relationship at a time.” Joe’s film From the Eyes of Hope won Best Documentary at the National Film Festival for Talented Youth. Joe is based in Los Angeles and Avery in Seattle. CLAUDIA LUNA-MEZA ’13 teaches high school science through Teach for America in the Rio Grande Valley of South Texas. The challenge is a daunting one — for every 100 students entering a public school classroom in this region, only 12 will earn any type of degree within six years of graduation. A year ago, Claudia was an intern in Uganda with Development Companions International. AtSPU, she was active in the Minority Association of Premed Students, and her hometown is Blackfoot, Idaho.